The Clackamas County Soil and Water Conservation District recently received a statewide honor from the United States Department of Agriculture’s Natural Resources Conservation Service(NRCS). 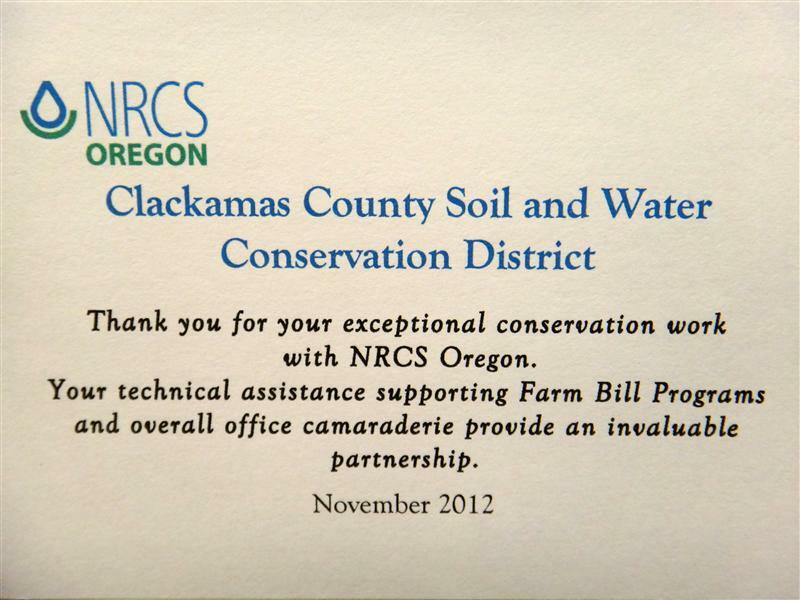 The NRCS singled out Clackamas for the 2012 Soil and Water Conservation District Partnership award. This statewide honor recognizes a soil and water conservation district that has provided outstanding conservation assistance and service as a partner to NRCS. The NRCS selection committee sought partners that provided exemplary assistance to and partnership with NRCS in carrying out its mission at a basin, multi-basin, or statewide level. The District supported the NRCS’ Environmental Quality Incentive Program (EQIP) by implementing a district loan and cost sharing program, helping two landowners install and complete EQIP contract items. These include a dairy pond agitator and up-front dollars for a seasonal high tunnel. District staff also worked with NRCS to write, design and implement at least eight Farm Bill Program conservation plans and collaborated with NRCS on two Conservation Innovation Grant proposals. In addition, the District’s conservation planners assisted landowners with other projects and practices that are not included in the NRCS target area. The most significant achievement in the 2012 fiscal year was the partnership with NRCS and other agencies to implement more than 700 linear feet of stream bank, habitat restoration, and Conservation Reserve Enhancement Program improvements along Milk Creek. NRCS Engineer Meghan Walter worked with District Riparian Specialist Jenne Reische to design the project. This project included tree and root wad revetments, engineered logjams, and strategic large rock placement to stabilize the stream bank and improve fish habitat. The District matched funds provided by a number of agencies to install the main structure. 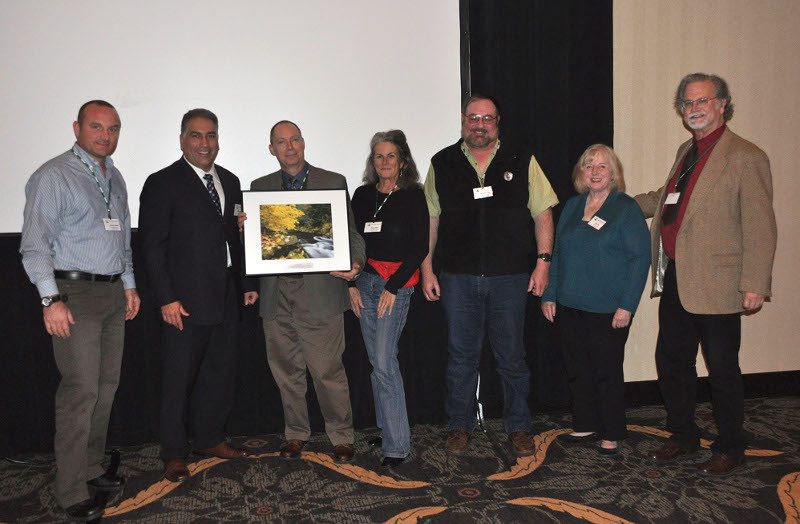 Ron Alvarado, NRCS State Conservationist for Oregon, presented the honor at the Oregon Association of Conservation Districts conference in Eugene, Oregon last week. 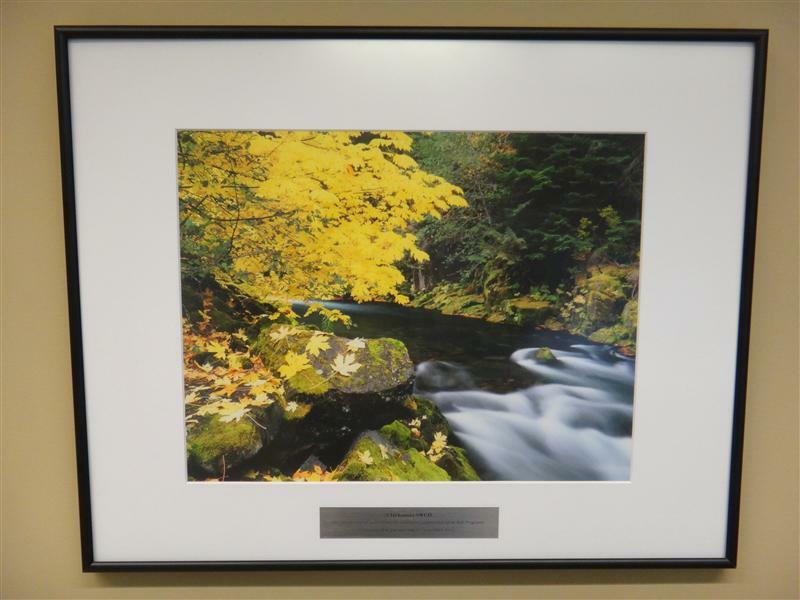 It was with great pride that Clackamas County Soil and Water Conservation District accepted this award. The District values and appreciates the partnership with NRCS because it helps landowners conserve our precious natural resources.